Is Detroit a humanitarian zone? No. 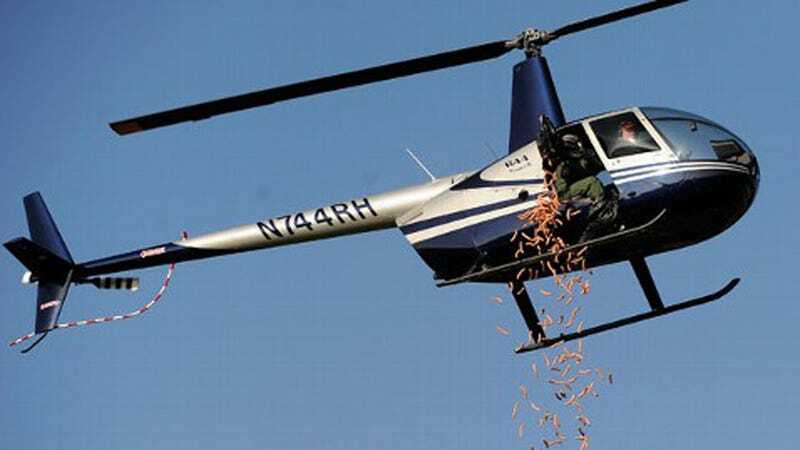 But a helicopter just dropped 955 hot dogs over the beleaguered metropolis to commemorate the American Coney Island restaurant's 95th anniversary. Things are looking up, Motor City! Below the chopper, 25 people waited to gather as many franks as they could, for a contest co-hosted by a local radio station. The winner went home with a thousand bucks and free American Coney dogs for a year. Though they might have gotten their fill already, what with the wiener monsoon. Let's hope the sausage hoarders were wearing helmets, too; the owner of the eatery, Grace Keros, said they dumped a total of about 140 pounds of processed meat.